OrbsCorbs: Despite more than doubling fees on residents and receiving $316,000.00 in grants every year, and taking in over a whopping $1.5 million dollars a year for recycling, city still needs more money for recycling carts!!!! Despite more than doubling fees on residents and receiving $316,000.00 in grants every year, and taking in over a whopping $1.5 million dollars a year for recycling, city still needs more money for recycling carts!!!! "The city is asking residents to pay $38K more towards recycling carts. "The city purchased 28,500 carts for $1.3 million dollars in 2010. If we do basic math and take the 28,500 carts and charged $26 each for 10 years, that’s $7.6 million dollars. In addition to receiving a yearly grant in the amount of $306K. "So the big question here is, WHERE IS THE MONEY? How much has been takin in as a result of the new and old taxes, and where is the money going?" 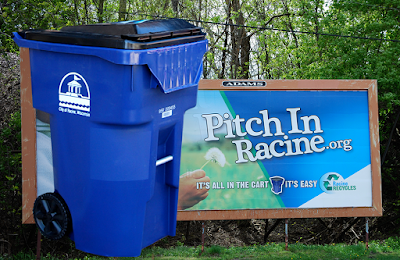 Racine City Hall: all lies, all the time.